Independently Yours Medical Supplies sells and rents Golden Technologies Lift Chairs in Colorado. 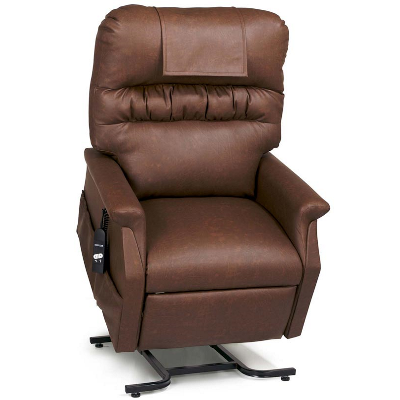 Rental lift chairs or stand assist chairs are ideal for people recovering from surgery or healing from an injury and need a comfortable, electric recliner that also helps lift them up. Lift chairs (electric recliners that lift you to a standing position) are designed to spend many hours of the day in, and even sleep in them. At Independently Yours Medical Supplies, we have a large supply of rental lift chairs. We rent the Golden Monarch Lift Chair in a Chestnut Vinyl Fabric that is easy to clean and sanitize before and after each rental. Our rental stand assist chair features a 2 button remote that allows you to recline, sit and stand up all with the press of a button. Just let go of the button when you have reached your desired position and level of comfort. When you rent or purchase a lift chair from Independently Yours, we deliver, set it up and pick it up free of charge. Visit one of our stores in Louisville, CO or Parker, CO to test out our rental lift chair before renting. – Lifting Capacity: 375 lbs. Visit one of our store locations to try out our rental lift chair by Golden Technologies before renting. Independently Yours Medical Supplies provides home medical equipment and related services, such as grab bar and stair lift installations, throughout Colorado to make living independently easier. Independently Yours offers rental medical equipment such as hospital beds, power scooters, lift chairs, wheelchairs, knee scooters, transport chairs, walkers, crutches, and patient lifts (Hoyer Lift and Sit to Stand Lift). Denver, Louisville, Colorado Springs, Parker, Aurora, Franktown, Elizabeth, Kiowa, Monument, Littleton, Highlands Ranch, Centennial, Englewood, Golden, Lakewood, Longmont, Erie, Lafayette, Superior, Boulder, Westminster, Broomfield, Arvada, Brighton, Wheatridge, and Thornton.